Today we celebrate the feast of St. Lawrence, a martyr and deacon of the 3rd century. 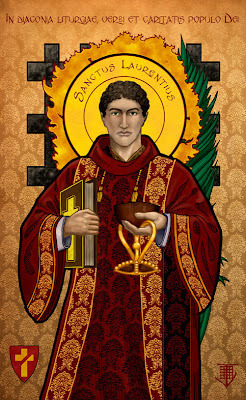 St. Lawrence is known primarily for two features, which are reflected in our readings today: his care for the poor and his martyrdom. Throughout his life he maintained a sense of humor that made him the patron saint of comedians. And what can we learn from the comedy routines of St. Lawrence? In the face of the world, we ought to laugh, recognizing how ridiculous the world is. People live and die for money and power. We live and die for Jesus Christ. The contrast is so enormous.